Pre-tensioner safety belt Your vehicle is equipped with driver's and front passenger's pre-tensioner safety belts. The purpose of the pretensioner is to make sure that excess slack is taken up in certain frontal collisions. The pre-tensioners may activate along with the front airbags in frontal collisions based on angle of impact, seat belt usage and impact severity. CAUTION The pre-tensioner seat belt is installed at the front seats, and the sensor is equipped inside the buckle, where presence of passenger is sensed by the fastening of the seat belts. 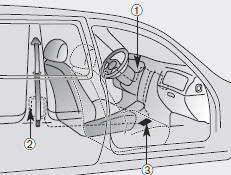 Therefore, pre-tensioner will not activate if the passenger is not fastened with the seat belts. Likewise, it will activate if buckled even without a passenger in the seat. Pre-tensioner seat belt is designed to activate when the seatbelt is in use. To ensure the pretensioner seatbelts activate in event of a possible seatbelt buckle switch malfunction, the system is designed to activate regardless of whether a seat belt is in use or if no seat belt use is detected within 6 seconds of turning the ignition switch ON. WARNING - Safety belt adjustment To obtain maximum benefit from a pre-tensioner seat belt: • The safety belt must be worn correctly. • The safety belt must be adjusted to the correct position. Load limiter When the pre-tentioner activates, if the system senses excessive seat belt tension on the driver or passenger’s seat belt, the load limiter inside the pre-tensioner will release some of the pressure on the affected seat belt. CAUTION - Airbag/Pretensioner dust When the airbags and pre-tensioners are activated, a loud noise may be heard and fine dust, which may appear to be smoke, may be visible in the passenger compartment. This dust is not toxic. The dust may cause skin irritation and should not be breathed for prolonged periods. Ventilate the vehicle after impact and wash your hands and face thoroughly after an accident. WARNING - Airbag/pretensioner warning light If the SRS airbag warning light does not illuminate when the ignition key is turned to “ON”, or if it remains illuminated after approximately 6 seconds, or if it illuminates while the vehicle is being driven, please have an authorized Kia dealer inspect the pre-tensioner and airbag system as soon as possible. CAUTION - Hot parts The pre-tensioner assembly mechanism become hot during activation. 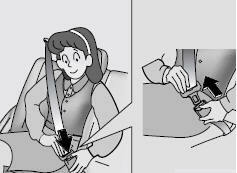 Do not touch the pretensioner seat belt assembly for several minutes after they have been activated. WARNING - Replacing used pre-tensioners • Pre-tensioners are designed to operate once. After activation, pre-tensioner seat belts must be replaced. All seat belts, of any type, should always be replaced after they have been worn during a collision. • Do not attempt to replace the pre-tensioners yourself. This must be done by an authorized Kia dealer. WARNING - Damaging the pre-tensioners • Do not hit or strike the pretensioner assemblies, especially with a tool or heavy object. • Do not attempt to service or repair the pre-tensioners. WARNING If the vehicle or pre-tensioner seat belt must be discarded, contact an authorized Kia dealer. WARNING - Safety belts To minimize the risk of serious or fatal injury in an accident, the driver and all passengers should use the appropriate safety restraints for their age and size. The presence of airbags does not change the need to be properly restrained by a safety belt or size-appropriate child restraint. In fact, airbags are designed to work the best when passengers are correctly restrained in the vehicle. • Be sure you are familiar with the information in this section, including the information on infant and child restraints. • Read the safety warnings on the sun visors of your vehicle also. We strongly recommend that the driver and all passengers be properly restrained at all times by using the safety belts provided with the vehicle. Proper use of the safety belts decreases the risk of severe injury or death in accidents or sudden stops. In most states, and in Canada, the law requires their use. All seats have lap/shoulder belts. Inertial locks in the safety belt retractors allow all of the lap/shoulder safety belts to remain unlocked during normal vehicle operation. This allows the occupants some freedom of movement and increased comfort while using the safety belts. If a force is applied to the vehicle, such as a strong stop, a sharp turn, or a collision, the safety belt retractors will automatically lock the safety belts. Since the inertial locks do not require a collision in order to lock up, you may become aware of the safety belts locking while braking or going around sharp corners. Always use the rear seat position(s) to install your child restraint(s). WARNING - Child restraint in front seat Never install a child restraint system in the front passenger position, as an inflating airbag could cause serious or fatal injury to a child in that position. The rear safety belts use a special auto-lock feature designed to allow a child restraint to be used in these positions without an added locking clip. They normally lock only under extreme or emergency conditions (emergency lock mode). However they can be adjusted so that they remain fixed and locked when a child restraint system is placed in these positions. (Use this auto-lock mode only to secure a child restraint, never for passengers restrained by the safety belts.) Page 3-48 gives instructions on placing the safety belt in the auto lock mode. The drivers safety belt can only operate in the emergency lock mode. 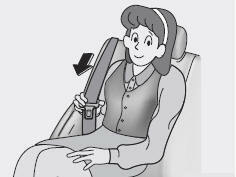 Safety belts provide the best restraint when: • The seatback is upright. • The occupant is sitting upright (not slouched). • The lap belt is snug across the hips. • The shoulder belt is snug across the chest. • The knees are straight forward. To help you remember to fasten your safety belt, a warning light will blink. WARNING - After a collision • Lap/shoulder belt assemblies may be stretched or damaged when subjected to the stress and forces of a collision. • The entire restraint system should be inspected following any collision. All belts, retractors, anchors and hardware damaged by a collision should be replaced before the vehicle is operated again. WARNING - Cargo area Passengers should never be allowed to ride in the cargo area of a vehicle. No safety belts are provided for the cargo area. Persons riding in the vehicle without a fastened safety belt are much more likely to suffer serious bodily injury or death during an accident. WARNING - Twisted belts A twisted or jammed safety belt cannot restrain you properly. If you cannot untwist or unjam the safety belt, have an authorized Kia dealer service it immediately. Never drive or ride with a twisted or jammed safety belt. WARNING - Belt use Safety belts must be used correctly to work properly in an accident. Each seating position in your vehicle has a specific safety belt assembly that includes a buckle and tongue designed to be used together. Failure to heed these warnings and follow these instructions will increase the risk and severity of injuries and the likelihood of death in an accident. 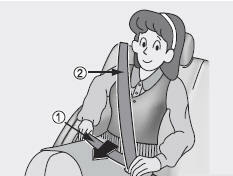 • Use the shoulder portion of the safety belt on the outside shoulder only. Never wear the shoulder portion under the arm. • Never swing the safety belt around your neck to fit over the inside shoulder. • Never wear the shoulder portion of the safety belt across the neck or face. • Wear the lap portion as low as possible. Be sure that the lap belt fits snugly around the hips. Never wear a lap portion of a lap/shoulder belt over your waist; it should always go over the stronger area of your hips. • Never use a single safety belt for more than one person. 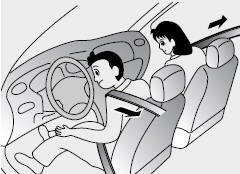 • The front seatbacks should always remain in a comfortable, upright position when the vehicle is moving. WARNING - Safety belt care • A damaged belt may not give you the protection you need in an accident. • Inspect your safety belts periodically for excessive wear or damage. Pull out each belt fully and look for fraying, cuts, burns or other damage. Pull the safety belt out and let it retract a number of times. Make sure that the lap/shoulder belts return smoothly and easily into the retractor. • Check the latches to make sure they latch and release without interference or delay. • Never close the doors on any part of the lap or shoulder belt. • Any belt not in good condition or in good working order should be promptly replaced. CAUTION Never close the doors on any part of the lap or shoulder belt. It can damage the safety belt or buckle which could increase the risk of injury in case of an accident. Safety belt warning light and chime If the driver's safety belt is not fastened when the key is turned ON or if it is unfastened after the key is turned ON, the safety belt warning light blinks until the belt fastened. If the driver's safety belt is not fastened when the key is turned ON or if it is unfastened after the key is ON, the safety belt warning chime will sound for approximately 6 seconds. At this time, if the safety belt is fastened, the chime will stop at once. Lap/shoulder belt To fasten the front lap/shoulder belt: 1. Grasp the buckle and tongue plate. 2. Slowly pull the lap/shoulder belt out from the retractor. 3. Insert the tongue plate (➀) into the open end of the buckle (➁) until an audible “click” is heard, indicating the belt is locked in the buckle. 4. Position the lap portion (➀) of the belt across your lap as LOW ON THE HIPS as possible to reduce the risk of sliding under it during an accident. 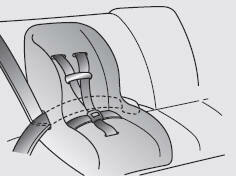 Adjust the belt to a SNUG FIT by pulling up on the shoulder portion (➁) of the safety belt. The belt retractor is designed to take up excess webbing automatically and to maintain tension on the belt. For your safety, do not put any excess slack into the safety belt at any location. NOTICE If you are not able to pull out the safety belt from the retractor, firmly pull the belt out and release it. Then you will be able to pull the belt out smoothly. 5. Adjust the shoulder anchor position to your size. To raise the anchor position, push the anchor up (➀). To lower the anchor position, press (➁) the button ( ) and slide the anchor down (➂). After adjustment, make sure the anchor is locked in position. 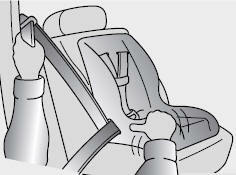 If the height of the adjusting seat belt is too near your neck, you will not be getting the most effective protection. The shoulder portion should be adjusted so that it lies across your chest and midway over your shoulder nearest the door and not your neck. WARNING • The height adjuster must be in the locked position when the vehicle is moving. • The misadjustment of height of the shoulder belt could reduce the effectiveness of the seat belt in a crash. To unfasten the front lap/shoulder belt: Press the release button on the buckle and allow the belt to slowly retract. Rear lap/shoulder belt To fasten the rear lap/shoulder belt: 1. Grasp the buckle and tongue plate. 2. Slowly pull the lap/shoulder belt out. 3. Insert the tongue plate (➀) into the open end of the buckle (➁) until an audible “click’’ is heard, indicating the belt is locked in the buckle. 4. Position the lap portion (➀) of the belt across your lap as LOW ON THE HIPS as possible to reduce the risk of sliding under it during an accident. 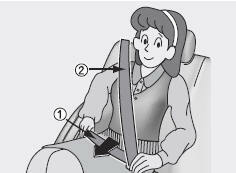 Adjust the belt to a SNUG FIT by pulling up on the shoulder portion (➁) of the safety belt. The belt retractor is designed to take up excess webbing automatically and to maintain tension on the belt. For your safety do not put any excess slack into the safety belt. To unfasten the rear lap/shoulder belt: Press the release button on the buckle and allow the belt to slowly retract. 3 Point rear center belt (if equipped) To fasten the rear center belt 1. Extract the tongue plate from the hole on the belt assembly cover and slowly pull the tongue plates out from the retractor. CAUTION - Cargo Be sure that the cargo is securely loaded in the rear cargo area. Loose cargo may damage the rear center safety belt in sudden stops or certain collisions. 3. Pull the tongue plate (B) and insert the tongue plate (B) into the open end of the buckle (D) until an audible “click” is heard, indicating the latch is locked. Make sure the belt is not twisted. There will be an audible “click” when the tab locks in the buckle. The safety belt automatically adjusts to the proper length only after the lap belt is adjusted manually so that it fits snugly around your hips, if you lean forward in a slow, easy motion, the belt will extend and let you move around. If there is a sudden stop or impact, the belt will lock into position. It will also lock if you try to lean forward too quickly. WARNING When using the rear safety center belt, you must lock all tongue plates and buckles. If any tongue plate or buckle is not locked, it will increase the chance of injury in the event of collision. To unfasten the rear center belt 1. Press the release button on the buckle (D) and remove the tongue plate (B) from the buckle (D). 2. To retract the rear center seatbelt, insert the key or similar small rigid device into the web release button on the anchor connector. Pull up on the seat belt web (A) and allow the webbing to retract automatically. 3. Insert the tongue plate (A) into the hole on the belt assembly cover. When using the rear center seat belt, the buckle with the “CENTER” mark must be used. Proper use and care of the safety belt system To ensure that the safety belts provide the maximum protection, please follow these instructions: • Use the belts at all times - even on short trips. • If the safety belt is twisted, straighten it prior to use. • Keep sharp edges and damaging objects away from the belts. • Periodically inspect belt webbing, anchors, buckles and all other parts for signs of wear and damage. Replace damaged, excessively worn or questionable parts immediately. • To clean the belt webbing, use a mild soap solution recommended for cleaning upholstery or carpets. Follow the instructions provided with the soap. • Do not make modifications or additions to the safety belt. 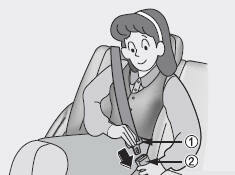 • After wearing a safety belt, make sure it fully retracts to the stowed position. Do not allow the belt to get caught in the door when you close it. WARNING - Belt cleaning Do not bleach or dye the webbing because this may weaken the webbing fibers and allow them to fail when restraining an occupant in a collision. WARNING - Pregnant women Pregnant women must never place the lap portion of the safety belt over the area of the abdomen where the fetus is located or above the abdomen where the belt could crush the fetus during an impact. Restraint of infants and small children To increase their safety, infants and young children should always be restrained by a restraint system approved for their age and size. Never allow a child to stand or kneel on the seat of a moving vehicle. Never allow a safety belt to be placed around both a child and an adult or around two children at the same time. It is best for children to be seated in the rear seats. Many companies manufacture child restraint systems (often called child seats) for infants and small children. An acceptable child restraint system must always satisfy Canadian Motor Vehicle Safety Standards. Make sure that any child-restraint system you use in your vehicle is labelled as complying with Federal Safety Standards. The child-restraint system should be chosen to fit both the size of the child and the size of the vehicle seat. Be sure to follow any instructions provided by the child-restraint system manufacturer when installing the childrestraint system. WARNING - Children on laps Never hold a child on your lap or in your arms in a moving vehicle. Even a very strong person cannot hold onto a child in the event of even a minor collision. CAUTION - Hot metal parts Safety belts and seats can become hot in a vehicle that has been closed during warm/hot weather; they could burn a child. Check seat covers and buckles before you place a child anywhere near them. WARNING - Infants and young children • Infants and young children are at much greater risk of serious injury or death in an accident or sudden stop if they are unrestrained or restrained improperly. Follow all instructions in this section and the instructions that came with an approved child safety system. The child restraint must be correctly installed in the vehicle, and the child must be correctly placed in the child restraint. • All children under 12 are safest in the back seat. • Never install a child or infant seat in the front passenger position. The baby will be injured or killed by the airbag if it deploys. • Never allow a child to stand or kneel on the seat of a moving vehicle. Restraint of larger children As children grow, they may need to use new child-restraint systems, including larger child seats or booster seats, which are appropriate for their increased size. A child who has outgrown available child-restraint systems should use the belts provided in the vehicle. 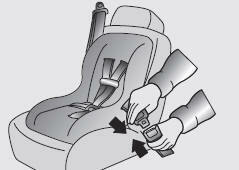 When seated in the rear outboard seats, the child should be restrained by the lap/shoulder belt. If the shoulder belt portion slightly touches the child’s neck or face, try placing the child closer to the center of the vehicle. If the shoulder belt still touches their face or neck they need to be returned to a child restraint system. In addition, after-market devices are available from independent manufacturers which help pull the shoulder belt down and away from the child’s face or neck. WARNING - Shoulder belts on small children • Never allow a shoulder belt to be in contact with a child’s neck or face while the vehicle is in motion. 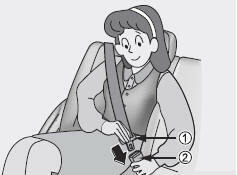 • If safety belts are not properly worn and adjusted, there is a risk of death or serious injury to such a child. Child restraint system For small children and babies, the use of a child seat or infant seat is strongly recommended and is required by law in almost all states. This child seat or infant seat should be of appropriate size for the child and should be installed in accordance with the manufacturer's instructions. Children riding in the car should sit on the rear seat and must always be properly restrained to minimize the risk of injury in an accident, sudden stop or sudden maneuver. According to accident statistics, children are safer when properly restrained in the rear seats than in the front seat. Child restraint systems are designed to be secured in vehicle seats by lap belts or the lap belt portion of a lap/shoulder belt or by a LATCH system (if equipped). Children could be injured or killed in a crash if their restraints are not properly secured. For small children and babies, a child seat or infant seat must be used. Before buying a particular child restraint system, make sure it fits your car and seat belts, and fits your child. 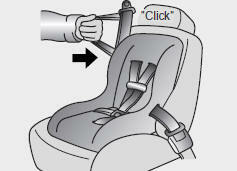 Follow all the instructions provided by the child seat manufacturer when installing the child restraint system. WARNING - Child restraints • A child restraint system must be placed in the rear seat. Never install a child or infant seat on the front passenger's seat. Should an accident occur and cause the passenger airbag to deploy, it could severely injure or kill an infant or child seated in the front seat. • Since a safety belt or child restraint system can become very hot if it is in a closed vehicle, be sure to check the seat cover and buckles before placing a child there. • When the child restraint system is not in use, store it in the trunk or fasten it with a safety belt so that it will not be thrown forward in the case of a sudden stop or an accident. • Children who are too large to be in a child restraint should sit in the rear seat and be restrained with the available lap/shoulder belts. • When using the vehicles lap/shoulder safety belts, always make sure that the shoulder belt portion is positioned midway over the shoulder, never across the neck or behind the back. The lap belt portion of the lap/shoulder belt must always be positioned as low as possible on the child's hips and as snug as possible. • If the vehicles safety belt will not properly fit the child, you must use an appropriate child restraint or booster seat in the rear. • Never allow a child to stand up or kneel while the vehicle is moving. • Never use an infant carrier or child seat that "hooks" over a seatback. It will not provide adequate protection in an accident. • Never allow a child to be held while they are in a moving vehicle, as this could result in serious injury to the child in the event of an accident or a sudden stop. Holding a child in a moving vehicle does not provide the child with any protection during an accident, even if the person holding the child is wearing a seat belt. Installing a child restraint system For safety reasons, we recommend that the child restraint system be used in the rear seats. Never place a rear-facing child restraint in the front passenger seat, because of the danger that an inflating passenger side air bag could impact the rear-facing child restraint and kill the child. Since all passenger safety belts move freely under normal conditions and only lock under extreme or emergency conditions (emergency lock mode), you must manually change these safety belts to the auto lock mode to secure a child restraint. WARNING - Child seat installation • Before installing the child restraint system, read the instructions supplied by the child restraint system manufacturer. • If the safety belt does not operate as described in this section, have the system checked immediately by your authorized Kia dealer. • Failure to observe this manual's instructions regarding child restraint system and the instructions provided with the child restraint system could increase the chance and/or severity of injury in an accident. Placing a passenger safety belt into the auto lock mode The use of the auto lock mode will ensure that the normal movement of the child in the vehicle does not cause the safety belt to be pulled out and loosen the firmness of its hold on the child restraint system. 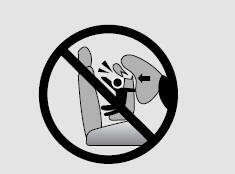 To secure a child restraint system, use the following procedure. Installing a child restraint system by lap/shoulder belt To install a child restraint system on the outboard or center rear seats, do the following: 1. Place the child restraint system in the seat and route the lap/shoulder belt around or through the restraint, following the restraint manufacturer’s instructions. Be sure the safety belt webbing is not twisted. 2. Fasten the lap/shoulder belt latch into the buckle. Listen for the distinct “click” sound. Position the release button so that it is easy to access in case of an emergency. 5. Remove as much slack from the belt as possible by pushing down on the child restraint system while feeding the shoulder belt back into the retractor. 6. Push and pull on the child restraint system to confirm that the safety belt is holding it firmly in place. If it is not, release the safety belt and repeat steps 2 through 6. 7. Double check that the retractor is in the “Auto Lock” mode by attempting to pull more of the safety belt out of the retractor. If you cannot, the retractor is in the “Auto Lock” mode. To remove the child restraint, press the release button on the buckle and then pull the lap/shoulder belt out of the restraint and allow the safety belt to retract fully. WARNING - Auto lock mode The lap/shoulder belt automatically returns to the “emergency lock mode” whenever the belt is allowed to retract fully. Therefore, the preceding seven steps must be followed each time a child restraint is installed. If the safety belt is not placed in the “Auto lock” mode, severe injury or death could occur to the child and/or other occupants in the vehicle in a collision, since the child restraint will not be effectively held in place. Securing a child restraint seat with “Tether Anchor” system Child restraint hook holders are located on the floor behind the rear seats. 1. Open the tether anchor cover on the floor behind the rear seats. 2. Route the child restraint seat strap over the seatback. For vehicles with adjustable headrest, route the tether strap under the headrest and between the headrest posts, otherwise route the tether strap over the top of the seatback. 3. Connect the tether strap hook to the appropriate child restraint hook holder and tighten to secure the seat. WARNING - Tether strap If the tether strap is secured incorrectly, the child restraint seat may not be restrained properly in the event of a collision. Do not mount more than one child restraint seat to a tether anchorage, since the anchorage can then fail in a collision. WARNING - Child restraint check Check that the child restraint system is secure by pushing and pulling it in different directions. 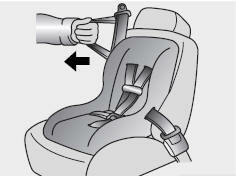 Incorrectly fitted child restraints may swing, twist, tip or come away causing death or injury. WARNING - Child restraint anchorage • Child restraint anchorages are designed to withstand only those loads imposed by correctly fitted child restraints. Under no circumstances are they to be used for adult seat belts or harnesses or for attaching other items or equipment to the vehicle. • The tether strap may not work properly if attached somewhere other than the correct tether anchor. Child seat lower anchors Some child seat manufacturers make child restraint seats that are labeled as LATCH or LATCH-compatible child restraint seats. LATCH stands for "Lower Anchors and Tethers for Children". These seats include two rigid or webbing mounted attachments that connect to two LATCH anchors at specific seating positions in your vehicle. This type of child restraint seat eliminates the need to use seat belts to attach the child seat in the rear seats. LATCH anchors have been provided in your vehicle. The LATCH anchors are located in the left and right outboard rear seating positions. Their locations are shown in the illustration. There is no LATCH anchor provided for the center rear seating position. The LATCH anchors are located between the seatback and the seat cushion of the rear seat left and right outboard seating positions. Follow the child seat manufacturer’s instructions to properly install child restraint seats with LATCH or LATCH-compatible attachments. Once you have installed the LATCH child restraint, assure that the seat is properly attached to the LATCH and tether anchors. Also, test the child restraint seat before you place the child in it. Tilt the seat from side to side. Also try to tug the seat forward. Check to see if the anchors hold the seat in place. CAUTION Do not allow the rear seat belt webbing to get scratched or pinched by the child-seat latch and LATCH anchor during the installation. WARNING When using the vehicle’s “LATCH” system to install a child restraint system in the rear seat, all unused vehicle rear seat belt metal latch plates or tabs must be latched securely in their seat belt buckles and the seat belt webbing must be retracted behind the child restraint to prevent the child from reaching and taking hold of unretracted seat belts. Unlatched metal latch plates or tabs may allow the child to reach the unretracted seat belts which may result in strangulation and a serious injury or death to the child in the child restraint. WARNING - LATCH lower anchors LATCH lower anchors are only to be used with the left and right rear outboard seating positions. Never attempt to attach an LATCH equipped seat in the center seating position.You may damage the anchors or the anchors may fail and break in a collision.